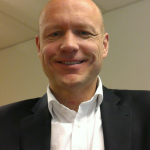 Bo-Christer Bertilson, employed by Karolinska Institutet and Stockholms Läns Landsting as research group leader and coordinator of academic primary care centers. Expert in primary care, scentific evaluation work and pain diagnosis and treatment. Björn Hansell, employed by Experio Lab and Landstinget i Värmland. Responsible for the service design process to identify detailed user needs and build great user experiences. Cheng Zhong, employed by KTH Royal Institute of Technology. Data scientist with core competence in machine learning and data mining. Project coordinator with business, process and IT development competence.